Tried the trustpilot site but unable to access. I visited the Darlington store on Saturday 11th August 2018 with a view to purchasing an eternity ring for our Ruby Wedding anniversary. Due to arthritis in my hands I am unable to get on my rings as my joints are quite big. I was taken care of by Janice who listened to my requests and went out of her way to ensure that I got the best for me. I left the store with an "engagement" ring and a wedding band at a very reasonable price and am more than happy with my purchases. Would I go back to H & T? Yes in an instant. Very good. Picked up at my local branch. 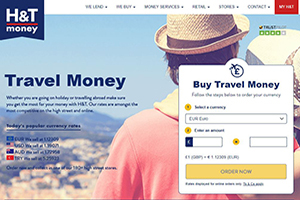 Whether you are going on holiday or travelling abroad make sure you get the most for your money with H and T. Our rates are amongst the most competitive on the high street and online.